Karen M Morin’s new paper, published earlier this year in Environment and Planning D: Society and Space, entitled “”Security here is not safe”: violence, punishment, and space in the contemporary US penitentiary” addresses the applicability of Agamben to the carceral context. The paper takes as its focus the US penitentiary at Lewisburg, Pennsylvania, which was retrofitted in 2008 to offer the country’s first federal Special Management Unit (SMU) programme of its kind. This model SMU is designed for federal inmates from around the country identified as the most intractably troublesome, and features double-celling of inmates in tiny spaces, in 23-hour or 24-hour a day lockdown, requiring them to pass through a two-year programme of readjustment. These spatial tactics, and the philosophy of punishment underlying them, contrast with the modern reform ideals upon which the prison was designed and built in 1932. The SMU represents the latest punitive phase in American penology, one that neither simply eliminates men as in the premodern spectacle, nor creates the docile, rehabilitated bodies of the modern panopticon; rather, it is a late-modern structure that produces only fear, terror, violence, and death. This SMU represents the latest of the late-modern prisons, similar to other supermax facilities in the US but offering its own unique system of punishment as well. While the prison exists within the system of American law and jurisprudence, it also manifests features of Agamben’s lawless, camp-like space that emerges during a state of exception, exempt from outside scrutiny with inmate treatment typically beyond the scope of the law. In early view on the website of the Annals of the Association of American Geographers, Anne Bonds’ new paper “Economic Development, Racialization, and Privilege: “Yes in My Backyard” Prison Politics and the Reinvention of Madras, Oregon” takes further her work on prison siting. The article draws from geographic engagements with theories of racialization and NIMBYism to explore connections between economic development and the relational construction of racial identities. In the paper, Bonds investigates the discourses of local white leadership surrounding two interconnected economic agendas crafted with the goal of remaking the central Oregon town of Madras into an upscale, white community, including (1) entrepreneurial prison development, and (2) an urban renewal project emphasizing high-income residential construction and the removal of “blighted” housing. Community leaders framed these developments as essential to changing perceptions of Madras based on its racial makeup and entrenched poverty. White officials promoted prison recruitment and upscale housing development through a normative racial framework that reaffirmed the privileged status of whites, stigmatized Latinos and Native Americans, and (re)produced unequal spaces. Through this empirical focus, she calls attention to the centrality of race in economic practices, emphasizing how racialized privilege and marginalization are reproduced through development agendas that give shape to geographies of opportunity and (dis)advantage. PhD Studentship opportunity with University of Leicester’s project ‘The carceral archipelago: transnational circulations in global perspective, 1415-1960″. This generously funded studentship would suit an ambitious, motivated student, passionate about history, with a background in history, a social science and/or Russian. The role of prison architecture and aesthetics in the relationship between prisons and host communities. Supervisors: Dr Dominique Moran, Senior Lecturer in Human and Carceral Geography (GEES) and (externally) Prof. Yvonne Jewkes (Department of Criminology, University of Leicester). Applications are invited for the above studentship commencing 1st January 2014. This is an ESRC-funded grant-linked studentship which provides a stipend of £13,726 p.a. plus tuition fees at the UK/EU rate for up to three years (full-time only). Due to funding restrictions, this studentship is open to UK and EU applicants only. The UK Economic and Social Research Council (ESRC) have made an award for a research project entitled “‘Fear-suffused environments’ or potential to rehabilitate? Prison architecture, design and technology and the lived experience of carceral spaces”. The project investigators, Professor Yvonne Jewkes (University of Leicester, UK) and Dr Dominique Moran (University of Birmingham, UK), will be addressing two over-arching questions – how are penal aims and philosophies (that is, what prison is ‘for’) expressed in prison architecture and design, and how effective is prison architecture, design and technology (ADT) in conveying and delivering that penal purpose? The study seeks to meet its objectives by (a) studying the process of designing new prison buildings in order to understand what it is that architects are asked to deliver and how they achieve this, and (b) studying ADT’s impacts and effects on a range of end users, focusing on the experience of occupying and moving in and around prison spaces, in relation to prisoners’ quality of life and wellbeing, perceptions of penal legitimacy, compliance with the regime, prisoner-staff relations, staff work satisfaction and so on. The project will focus on two newly built UK prisons, and contrast these with two prisons in Norway and Denmark, where penal philosophies differ greatly from those in the UK. The main research project asks what impact the architecture, design, and spatial organization of prisons has on the experience of imprisonment, on the behaviour of those who occupy and move through carceral spaces, and on staff-prisoner and staff-management relationships. The PhD studentship extends the reach of this question to a new and different group – members of local communities which surround prisons. It is premised on a understanding that, despite the wealth of research on local responses to proposed prison building projects, the impact of prisons on local economic development, and the “NIMBY” response, the specific impact of prison architecture and aesthetics on those who live within the immediate vicinity of prisons is not known. The studentship will draw upon existing research within both criminology and carceral geography on prison siting and the relationships between prisons and local communities. Although this literature has tended to focus on the traditional opposition of communities to location of prisons close by, (based on local residents’ concerns that a prison may lower property values, increase levels of crime, endanger their safety through escapes, attract ‘undesirable’ elements and damage the reputation of the area), there is increasingly an alternative perspective, of the generation of ‘profit through punishment’. In more recent work, demand for the building of prisons to stimulate local economic development and employment has been identified, especially on the part of small rural towns in the United States, with a shift towards policymakers actively locating prisons in ‘lagging’ communities. This recent work has drawn attention to the lack of structural economic change in persistently poor rural places, and prison facilities’ inability to foster economy-wide change in terms of serving as an economic development initiative. However, in focusing on structural economic change associated with prison siting, it has been unable to tackle questions about the response of local communities to the aesthetic appearance of the prisons themselves, and the importance of prison architecture in the ‘acceptance’ of prison siting close to existing communities. There are grounds to suggest that the aesthetic appearance of prisons is of considerable, yet under-explored, importance for local residents. The PhD studentship will build upon existing work by contributing to the growing international debate on prison siting using examples from the UK context, and it will complement the main project by investigating the architectural consequences of the transformations in UK prison architecture on the communities which surround prisons. Given the interdisciplinary nature of the main project, and of the supervisory team for the PhD project, along with postgraduate training in research methods and transferable and employable skills, this PhD studentship would enable the successful candidate to build an academic and professional CV which would enable them to pursue an academic research career in a range of disciplinary areas. There would be opportunities for joint publication with the supervisory team of main project co-I and PI, as well as opportunities to develop networking skills through participation in dissemination and impact activities, and to contribute to the main project website, www.prisonspaces.com, as appropriate. At Birmingham, the successful candidate would join a thriving Postgraduate Research community in the School of Geography, Earth and Environmental Sciences, and would be part of the Birmingham Community and Criminal Justice Group – the University’s very wide-ranging criminology scholarship network. Applicants will have a good first degree in a relevant social science discipline. An MSc/MA postgraduate degree in a related field is also highly desirable. Applicants should have excellent oral and written presentation skills, and experience with qualitative research methods. The closing date for applications is 30th September 2013. Shortlisted candidates will be invited to an interview, to take place soon after the closing date for applications. To apply, please contact Dr Dominique Moran (d.moran@bham.ac.uk). The UK Economic and Social Research Council (ESRC) have made an award of £728k for a research project entitled “‘Fear-suffused environments’ or potential to rehabilitate? Prison architecture, design and technology and the lived experience of carceral spaces”. The project investigators, Professor Yvonne Jewkes (University of Leicester, UK) and Dr Dominique Moran (University of Birmingham, UK), will be addressing two over-arching questions – how are penal aims and philosophies (that is, what prison is ‘for’) expressed in prison architecture and design, and how effective is prison architecture, design and technology (ADT) in conveying and delivering that penal purpose? The study seeks to meet its objectives by (a) studying the process of designing new prison buildings in order to understand what it is that architects are asked to deliver and how they achieve this, and (b) studying ADT’s impacts and effects on a range of end users, focusing on the experience of occupying and moving in and around prison spaces, in relation to prisoners’ quality of life and wellbeing, perceptions of penal legitimacy, compliance with the regime, prisoner-staff relations, staff work satisfaction and so on. The project will focus on two newly built UK prisons, and contrast these with two prisons in Norway and Denmark, where penal philosophies differ greatly from those in the UK. The project will provide funding for a Postdoctoral Research Assistant, based at the Department of Criminology, University of Leicester, and for a PhD studentship at the School of Geography, Earth and Environmental Sciences at the University of Birmingham, both to start in January 2014. Ads for these two positions will be posted soon – watch this space. ‘Carceral Spaces: Mobility and Agency in Imprisonment and Migrant Detention‘ (Ashgate, 2013) edited by Dominique Moran, Nick Gill and Deirdre Conlon. The book presents original empirical research from the USA, Colombia, Russia, France, the UK, Ireland and Romania, bringing together papers initially presented for themed sessions organised at the Annual Conference of the AAG in Washington, DC, USA and the Annual Conference of the RGS-IBG in London, UK, both in 2010. Apart from the editors, contributors include Lauren L Martin, Matt Mitchelson, Olivier Milhaud, Bénédicte Michalon, Julie De Dardel, Jennifer Turner, Nancy Hiemstra and Mason McWatters, with reflective pieces from Alison Mountz and Yvonne Jewkes. The broad conceptual focus and wide geographic net is consistent with the goals of sparking insight, dialogue and new connections across ordinarily distinct areas. This book was published last month and launched at the 2013 Annual Conference of the Association of American Geographers, in a roundtable session featuring editors and contributors. It’s available for purchase via Ashgate and Amazon. ‘Prisons and immigration detention facilities ostensibly draw sharp divisions between who is inside and who is outside, who is good and who is bad, who is included and who is excluded from society. Contributors to this important volume undermine these dualisms with rich empirical evidence and strong theoretical elaboration that advance the burgeoning field of carceral geography, and offer fresh perspectives to migration studies and criminologists’ study of “punishment and society”. 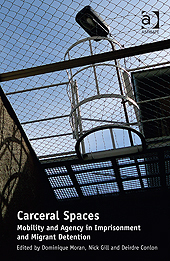 Carceral Spaces gathers original research on prison regimes and immigration detention estates from an impressive array of sites. This comparative dimension illustrates the international unevenness of spatial practices of confinement. Despite their differences, all carceral regimes create and rely on carceral spaces and carceral mobilities. Indeed, close attention to the relationship between the state’s power to confine and to forcibly move people is the book’s greatest strength. Together, they challenge the idea that prison cells fully extinguish political agency and that mobility necessarily means total freedom. Instead, careful documentation and nuanced theorization of this relationship offers scholars and activists new understandings of state power. This knowledge hopefully can enable people who are confined and their allies to end carceral regimes and the harms they create’.